Have you spent enough time in searching for the reasons that keep your competitors at the top in Google rankings? If you are a hair transplant or cosmetic surgery clinic, you must build the business that is based on the local areas and maybe this is the idea your competitors have applied before you and now they are leading the local hair transplant market. If you wish to beat your competitors you have to make an online marketing plan with the help of local SEO keyword search. It is OK if you can do it by yourself or you can hire a digital marketing agency. 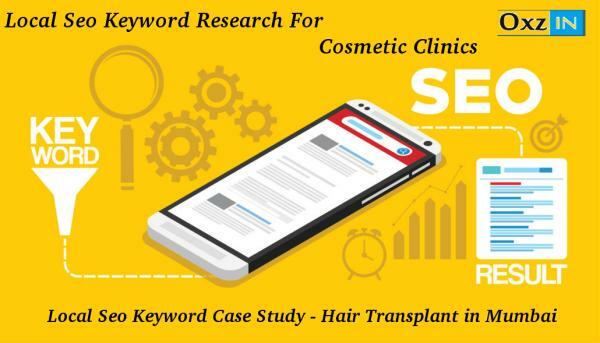 Local keyword search is the primary requirement for running an online marketing strategy and every local area may have some specific keywords for hair transplant according to the requirements of the patients and you have to look for the same phrases that are used by the patients when they use search engines to find the correct information and when they are interested in the clinics that are presented near their home. Online marketing is needed everywhere but it is essential in the cities where knock-out competition is taking place. If your hair transplant or cosmetic surgery business is running in such areas, you need a digital marketing agency for getting a clear picture of your status in the competition. There are thousands of local keywords phrases which people use in their daily search and, it can help in attracting huge traffic on your website, If you just identify the correct local search keywords. We can do it for you. We have recently done it for Mumbai that is considered as an extremely competitive market for hair transplant clinics. 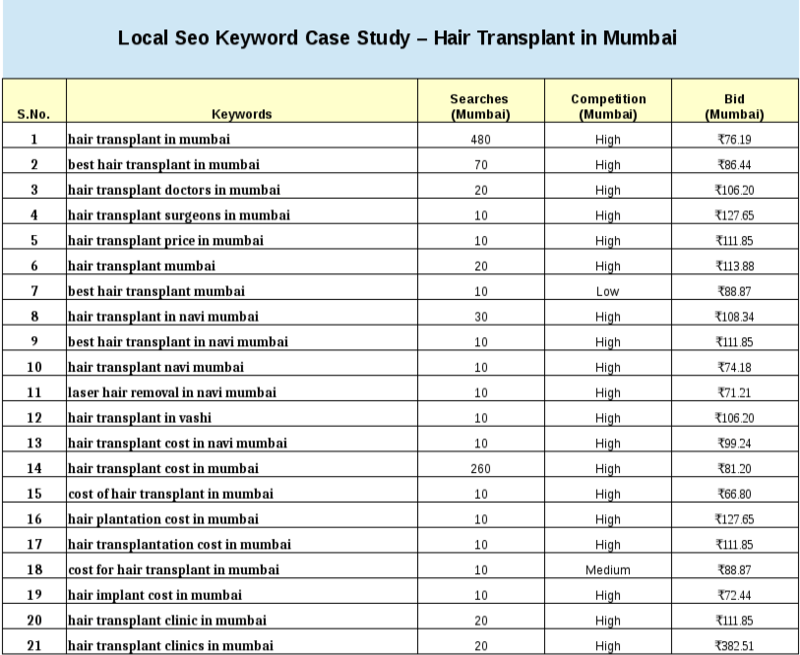 This report for local keywords search provides a clear and concise picture of the most important keywords used in the local search in the Mumbai city. This report presents a number of keywords with categories and subcategories and also and level of competition for every keyword. Furthermore, This report shows how your competitors have used the keywords in their marketing plan. As you see in the report, keyword analysis is an essential factor in the online marketing process and additionally, it helps you design some better strategies to beat your competitors. There may be some areas where your competitor is weak and that points may be your strong points. This report may be used in searching such vital points. Your budget is crucial for your online marketing strategy, and if you do not know which phrases are essential for you, it is tough to set a monthly or daily budget for your digital marketing plan. When you have a detailed local keywords search report on your table, you can think of making a perfect budget for the next month. You may check the report and ask for a free local keyword search report for your area. There are several combinations of phrases that are used by local people and every combination of the keywords can be converted into new opportunities for the hair transplant clinics. Our digital marketing agency is capable of conducting a deep research for any large or small area and provide a detailed and customized local SEO keyword search report to our clients. Finally, if you are not sure about the keywords you have to use in your online marketing campaign, contact us and we will prepare the local keyword search report for the next month.